Programs of Masonic education traditionally have stressed the importance of a proper preparation particularly for the accepted candidate. In making this emphasis, Masonic educators have realized that right beginnings can be the key to a rich and lifelong Masonic experience. A preview of certain aspects of Freemasonry is important to the proper preparation and orientation of the accepted candidate, but such a preview should not be the primary consideration of the instructor. If the instructor can foster the candidate’s interest, if he can share his own enthusiasm for Freemasonry, and if he can convince the candidate of his sincere interest in the individual’s progress in Masonry, he will have served both the accepted candidate and the Fraternity admirably. Educationally speaking, a positive start means that there has been elicited within the candidate an interest which will lead him to continue in the practice of his craft as a Freemason. A climate conducive of continued self improvement in Masonry shall be achieved along with a feeling of cooperative endeavor on the part of the instructor and the candidate. The instructor shall endeavor to understand the candidate’s particular background and point of view. The instructor shall endeavor to understand the candidate’s strengths and particular interests. show the intent of the Fraternity. Sheet AC3 is, obviously, intended specifically for the wife of the accepted candidate. The orientation session for the accepted candidate has as its goals (a) a general acquaintance with the emblem of Freemasonry, (b) a familiarization with the Fraternity and with the lodge and its Masonic significance. A very important part of setting the proper climate for Masonic educational sessions is the choice of the meeting place. It must be a place which is conducive to learning. Besides the educational personnel, it is recommended that the Tyler and at least the Junior Deacon be present during the first part of the orientation session. These two officers play a most important part in receiving and preparing the candidate at the time of his initiation. The accepted candidate should have a chance to make their acquaintance in a Masonic setting. Moreover, the correct attitude of both the Tyler and the Deacons is best assured through this sharing of the orientation session. Such a meeting together helps assure a team effort. During the pilot phase, in which this educational program was “field tested,” it was found most helpful if the master, wardens, and senior deacon could also be present at the first orientation session. In this way the accepted candidate gets to meet the officers who will be performing the degree work while sensing the interest which these officers and the lodge they represent have in a potential member of the Craft. If this approach is adopted, scheduling this instruction immediately prior to the EA rehearsal would be an easy way to introduce the Accepted Candidate to all of these officers. Lodge and preparation room should be uncluttered, orderly, and clean. First impressions are important. Bible closed upon altar with the square and compasses laid out as before the lodge is opened. Objective: To begin the accepted candidate’s Masonic orientation by focusing his attention on the esoteric symbol of the Craft, which, in time, he will wear with pride as a Master Mason. Essentials: The square and the compasses have been viewed as symbols of moral significance for thousands of years and wherever civilizations has thrived. In the process of your Masonic experiences you will learn much about the symbolism of these two ancient tools. For now you should know that the square symbolizes pride in excellent work, honesty, and honor. The compasses symbolize that our energies and actions must be controlled and well directed. To these two great symbols, Masons in the United States have added the letter “G” which reminds us that without God all enterprises of importance lose their significance. All across the world this symbol is recognized as the emblem of Freemasonry. Even the United States Patent Office so recognizes this symbol of Compasses and Square. For generations it has been worn with pride by Master Masons who are known to be builders of a better world. Reference for instructor: The Craft and Its Symbols. Objective: While it is obviously our purpose to familiarize the accepted candidate with this important part of the lodge building, there is a further objective. That objective is to impress upon the mind of the candidate that preparation must involve his heart and his mind. Essentials: You will be brought to this room before entering the Lodge upon your first Masonic experience as a candidate for the Entered Apprentice Degree. Here you will be prepared for your entrance. You will put on symbolic clothing. Everything has meaning in our Masonic practices including the clothing which you will wear while being initiated. The particular meaning will be fully explained to you during the degree work. To the man who comes to this room prepared in his heart and mind to seek and to find light and understanding, a truly significant experience lies before him. When you pass through this door as a candidate for the first degree in Masonry, you shall be commencing a journey which has been the inspiration to good men for centuries. Beyond this door is the lodge room. Many years ago when Freemasons were employed in the building of the great churches and buildings of the past the lodge was a shed like building in which the masons shaped, carved and fitted the parts for the building. In the lodge the apprentices learned the skills of their trade. The lodge was also the place where Masons sat to eat and the quarters where many of them slept. For us, the lodge still remains a place of learning and of fraternal enjoyment. Within our lodge, Masons meet to learn their craft as builders under the service of God and in behalf of their Brethren. Within the lodge we carry on such business as is necessary to our organization, and we perform our degree work. You will notice that we refer to the performing of degrees by using that time honored word “work.” The degrees represent an important part of the labors of present day Freemasons. Objective: To provide the accepted candidate an opportunity to see the lodge room as a space itself symbolically oriented and dedicated to a purpose which transcends four walls. Essentials: This is our lodge room. While we sometimes speak of this room as “the lodge,” our lodge is actually the closely united brethren who meet here. At the proper time in the future, there will be much to experience and discover concerning a lodge of Freemasons. At this time, I would like to focus your attention upon the altar which occupies the center of this room. Throughout the story of men, the altar has had a special significance. It is the center of his devotion to that which is far greater than himself. A Masonic altar always has a Book of Sacred or Religious law upon it. We use the Holy Bible, but in other lands where different religions exist the sacred books belonging to those faiths are used. You will notice that in addition to the Bible are, placed the square and compasses which have to Masons a special meaning. Their significance in relation to the Book of Sacred Law you will learn in the process of your Masonic experience. This Lodge room is itself a symbol and like the earth around us is oriented in relationship to the compass points. Here in the east is the chair of the Worshipful Master whose duty it is to direct and to guide the lodge. Beside the master is seated the Chaplain whose spiritual duties support the Master and the Brethren. On the floor and to the right of the Master’s chair is the seat of the Senior Deacon who will be your special conductor during the initiation ceremonies. If we walk clockwise as the sun would travel across the sky, we come to the south. This is the chair of the Junior Warden. Because the Junior Warden, as well as the Senior Warden and the Worshipful Master, has special responsibilities we speak of their chairs and places about the lodge as stations. On each side of the Junior Warden’s station are seated the Stewards whose duties include the preparation of food a duty which has its own importance. Still traveling as the sun rounds the sky, we come to the west and to the station of the Senior Warden who next to the Master holds the highest office with in the lodge. The Junior Deacon sits to the right of the Senior Warden. One of the duties of the Junior Deacon is to prepare the candidate for initiation. All of these officers have but a single intent and that will be to present to you the truths and insights of Freemasonry. You should realize that nothing is said or done in our degree work without having special significance. Many things may not be clear to you at the time you receive the degree. This is understandable. Each time we witness or take part in the work of the lodge, we get something more out of the Masonic ritual. After each degree, instruction will be available along with the opportunity to discuss your experiences with your Masonic instructor. Overview: The review of the Pollard Plan Booklet, The Accepted Candidate, provides an excellent opportunity for the instructor to work with the candidate on an individual basis. Through discussion the instructor can determine those areas in which special attention should be given in order to properly prepare the accepted candidate for initiation. The individual review sessions also provide an opportunity for the instructor and candidate to focus upon areas of special interest to the individual. The instructor should keep in mind the guidelines for adult education given in the introduction of this manual. The following portion covering the second section of the orientation process consists of the text of the Pollard Booklet interspersed with notes and references, which are designed to be of assistance to the instructor. Words in the Pollard text which may need definition for clarity are circled. A definition of these circled words is to be found in the supplement following this section of the manual. The best procedure for the instructor to follow is to use the outline of the booklet provided below to quickly review the text with the candidate. He should then initiate a discussion and dialogue over those points which are of particular interest to the candidate. With such a procedure in mind, it is obvious that only a part of the provided supplementary material may be utilized in any individual case. 2. Note to Instructor: The Instructor may find it wise to make some distinction between Freemasonry and “fraternal organizations” in general. While it is not our purpose to belittle any fraternal organization, Freemasonry should not be confused with many fraternities which may be familiar to the accepted candidate. The best approach, should the need arise, is to have the candidate describe his impression of fraternal organizations to which the instructor may respond as to whether such preconceptions apply to Freemasonry. “Symbolism” The importance of understanding the role of symbolism in Masonic philosophy and instruction cannot be overemphasized. The candidate should be aware of the vital role which symbolism plays in his everyday life. The following quote from Carlyle’s Sartor Resartus is worth mentioning: “. . . it is in and through symbols that man, consciously or unconsciously lives, works and has his being.” Even a brief enumeration of symbols employed in daily life should serve to show how true Carlyle’s statement is. (References – “Symbolism in Freemasonry.” Roberts, The Craft and Its Symbols pp. 46; Newton, The Builders, pp. 143 ff; Jones, freemasons’ Compendium ; Mackey’s Symbolism of. Freemasonry (revised by Clegg) ; Short Talk Bulletins (MSA), “Symbolism” March, 1925; February, 1952; July, 1954; and July, 1957, “quaint and beautiful old English.”) The accepted candidate should be encouraged to make a practice of noting any words used in our ritual which he does not understand or which seem strange. A supplemental list of words which often give candidates problems will be provided at the end of each instructional section in this manual. In addition, the instructor should have a good, standard dictionary close at hand during educational sessions. 4. Note to Instructor: We do not wish to so overuse this admonition that it loses its force. However, it is important that the candidate realize that Freemasonry demands a personal commitment and that it is only through such application that real benefit can be received. The Instructor can greatly assist by being sure that the candidate has every opportunity to participate in the educational sessions. Such questions by the instructor as “How do you feel about that?” are most appropriate. 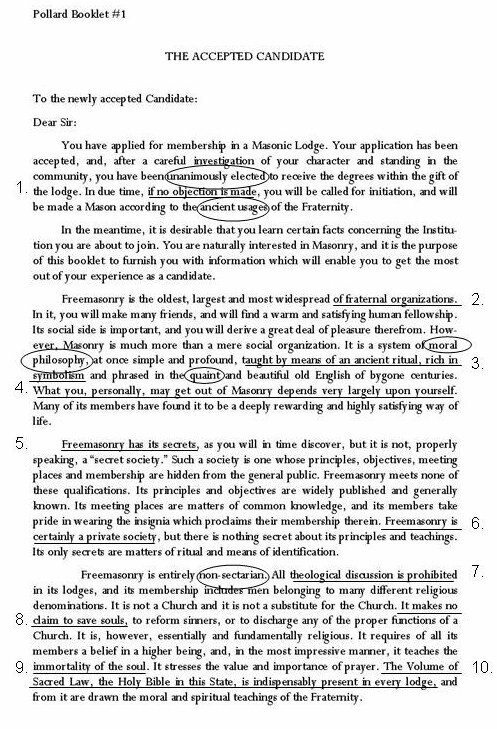 The last sentence in this paragraph contains the common description of Freemasonry as “a way of life.” This description should be coupled with the discussion of the candidate’s commitment to Masonry. It is to be a part of his life. It should be noted that the phrase is “a way of life” (as it is usually stated) and not “the way of life.” Such a distinction bespeaks Freemasonry tolerance and its encouragement to all members of the Fraternity to open their minds and hearts to the full range of religion, as well as to the arts and the sciences. Perhaps a more accurate description of Freemasonry is that it should be a most important element in our “way of life” offering a stable foundation and incentive upon which we may erect a superstructure of wisdom, character, and human understanding. 5. Note to Instructor: It is likely that the accepted candidate has encountered or will be confronted by those who feel that it is a childish practice for Masons to have any secrets. Such a view results from pseudo-sophistication and/or a lack of historical knowledge. While the holding of secrets by the Craft during the era of the building guilds did involve the maintenance of trade monopoly, the practice also embraced the fact that the truth and proper understanding can only be obtained by those who are willing to become an initiate and to strive and labor toward the final goal. In a real sense the keeping of Masonic secrets is part of our symbolic teaching. Moreover, Freemasonry has been a bulwark of freedom and human integrity and as such has been persecuted by totalitarian regimes. This fact coupled with the fact that the unscrupulous have often tried to exploit the Craft gives a certain grim reality to the need for secret modes of recognition. 7. Note to Instructor: What is indicated here by “theological discussions” is those debates over theological statements which are intended to be the basis for sectarian and dogmatic assertions of particular religions. 8. Note to Instructor: Perhaps no other single element so clearly separates Freemasonry from the closed systems of organized religions as the fact that Freemasonry offers no doctrine or formula for salvation such as characterize most religions. It is not the intent of Freemasonry to redeem the sinner, but rather to assist men who are dedicated to the proposition of being builders of character and a better society under God. 10. The Holy Bible is considered the Volume of Sacred Law within this Grand Jurisdiction. However, the accepted candidate should realize that Freemasonry recognizes the Holy Books of other major religions as also being volumes of sacred law. (References: Digest of Decisions; Coil’s Masonic Encyclopedia. 12. This paragraph may call for special attention. The prohibition against use of the fraternity for political purposes and the disruption of its labors by partisan disputes is not to be confused with Freemasonry’s admonition that the individual brother should take an active part in civil society and those institutions by which that society is politically and socially maintained. 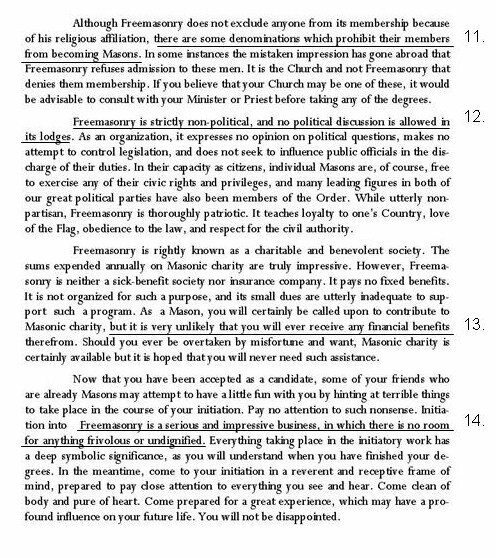 (Unless this distinction is understood by the accepted candidate, our pride, for instance, in the work of our country’s forefathers who were Masons may seem strange in lights of the forbidding of all political discussions within the lodge.) Note also that the history of the Fraternity gives proof of Freemasonry’s ability to surmounting the ravages resulting from civil and political strife. 13. The instructor may wish to stress that the benefits of membership in Freemasonry is more likely to be those of the spirit self fulfillment and understanding through a close association with brother Masons and through meaningful service to fellow men. The Instructor may wish to mention some of the lodge’s programs, such as that of “outreach” and the widow’s program. The quicker the new Mason understands the potential for personal and collective good which lies in the Masonic opportunities for service, the quicker he will begin his true Masonic education. Also recommended for the accepted candidate is the pamphlet Maine Freemasonry published by the Grand Lodge of Maine and available from the Grand Secretary’s office. 1. Physical. A petitioner must be a man in the full sense of the word. He must be of lawful age, 18, because no person can undertake all the Masonic obligations except he has reached years of discretion and is legally responsible for his acts. This rules out a young man under age; it also rules out a man in his dotage who has lost the powers by which a man recognizes and discharges his responsibilities. 2. Mental. The mental qualifications are not expressly defined, though a number of Grand Lodges demand that a petitioner be able to read and write English. But they are clearly implied and are as binding as though explicitly expressed. Much is taught a Mason; much is demanded of him; it is impossible for him to understand such teachings, or to meet the demands, unless he possesses at least average intellectual abilities. 3. Political. By these are meant all that have to do with citizenship and a man’s life as a neighbor, as a member of his community. It is required that he be a free man, in no sense a slave, a bondman, or one who has lost his rights of citizenship; his own master, free to discharge his Masonic duties without interference from outside. He must be “under the tongue of good report”; that is, possess a sound reputation among those who know him best. He must be a good citizen, one who is obedient, as the Old Charges express it, “to the Civil Magistrate,” and keeps himself from embroilment in rebellion and mobs in defiance of the claims of public order. 4. Moral. A Mason must be a “good and true man,” a man “of honor and honesty,” who governs himself by the Compass, tries himself by the Square, and tests himself by the Plumb. So imperious are the Fraternity’s moral requirements that to think of a Mason as not devoted to integrity and rectitude of character is a contradiction in terms. 5. Religious. It is required of a petitioner that he believes in God. It is required that all Masons practice tolerance, and that no petitioner be questioned as to the peculiar form or mode of his faith and he must not question his brethren. The privileges of Freemasonry are no greater than the responsibilities of its votaries. Your obligations as a member of the Fraternity will not conflict with those you have already assumed by virtue of your membership in modern society. On the contrary, the Masonic Fraternity reiterates, reinforces and reemphasizes them. (a) That the calling of a Freemason is a high one and that you should never suffer yourself to derogate from it. (b) That loyalty to home, to country, and to the Fraternity is expected of you at all times. (c) That patriotism is a bounden duty, and you should not countenance disloyalty or rebellion. (d) That the Masonic institution stands for liberty, equality and fraternity not only for Masons, but for all mankind. (e) That freedom of thought, speech, and action is the watchword of Freemasonry, as far as this is not incompatible with the same rights on the part of others. (f) That, in like manner, every Freemason is the enemy of ignorance, bigotry, oppression, superstition, and of all mental and spiritual darkness. (g) That a Mason champions the cause of the widow and the fatherless; and challenges the arbitrary assumption by anyone of the power to dictate the actions, beliefs and destinies of any group or individual. (h) That the time honored virtues so cherished by our forefathers are still “coin of the realm” among Masons, and that humility, patience, charity, and gentleness are among the hallmarks of purity and integrity of character. You should approach Masonry with a receptive mind. As you progress through the degrees, you should interpret for yourself, as far as possible, all that you.. hear and see. Whatever seems difficult or obscure should be a challenge to you to search out its meaning for you may be sure there is a meaning in every word and act of our ceremonies. When in seriousness of purpose you cross the threshold of the Lodge, it should become for you a sacred place. In a very vital sense, the Lodge will become a home in which you will learn contentment in service to your brethren, honor to your God, and in study of the many lessons Masonry seeks to teach. 1. When you come, be clean of body. And let this cleanliness be a symbol of a greater purification within your heart. Let it represent the integrity of your intentions. 2. Be clear in mind. Come with your mental faculties free from distracting thoughts that would tend to divert you from the instructions you will receive. Seek to set aside all prejudice and any spirit of antagonism. Be free to accept and assimilate the solemn truths you are about to receive. 3. Be pure in heart. Put away evil thoughts of every kind. If you have done anyone a wrong, seek honestly to redress it. 4. Be prayerful in spirit. Whether or not it is your habit to pray daily to your God, pray on the eve of your initiation for His blessing on the step you are about to take, for wisdom to understand, and for strength to keep you steadfast. We in the Masonic Fraternity are quite aware that you may feel some misgivings about your husband’s intention to join our order. His membership will take him occasionally away from you for an evening and leave you alone at home. You may be reflecting on his new outside interest. You may have unspoken questionings about Masonry itself. We can understand your feelings. We would like to ease your mind in this regard. It is one of Masonry’s ideals that its influence on a member may make him more loving, considerate, and thoughtful of those in his home. Those who respond to Masonic influence are likely to grow in those qualities a wife appreciates. This growth is not something which can be guaranteed, but it IS the INTENT of the Masonic Brotherhood. We sincerely hope that you will find that you have exchanged your occasional evenings alone for an increasingly devoted husband because of his affiliations with Masonry. We also hope that, in the future, we shall have the pleasure of your company at our semi public installations and our lodge programs especially planned for the wives of masons. Should you ever be in the need of assistance, we trust you will remember that there is a body of Freemasons who care.